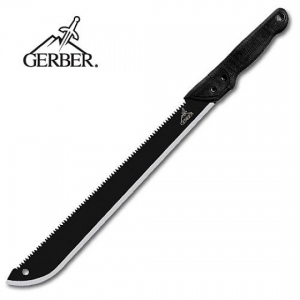 The Gerber Gator Machete wields a 45cm fine edge blade on one side, a 36cm high performance saw blade on the other and Gerber's proprietary Gator rubber grip for ergonomic control while using either. This machete carries a high carbon steel blade for strength and corrosion resistance, perfect for clearing and removing vegetation. The Gator Grip handle resists slipping in wet conditions and is shaped for safe and effective control. The reinforced riveted nylon sheath provides safe and easy portability.